The term multi-stakeholder processes describes processes which aim to bring together all key stakeholders to communicate about (and sometimes make decisions about) a particular issue. They are based on democratic principles of transparency and participation, and aim to develop partnerships and strengthen networks among stakeholders (Hemmati 2001). A multi-stakeholder consultation process which aims to consult widely, and maximise opportunities for engagement. However, while stakeholders’ opinions will almost certainly influence decision-making, the final decisions are made during processes in which they are not necessarily directly involved. A multi-stakeholder decision-making process in which representatives of key stakeholder groups come together in a mechanism which allows them to make decisions using democratic processes: ie. it goes beyond expressing an opinion. 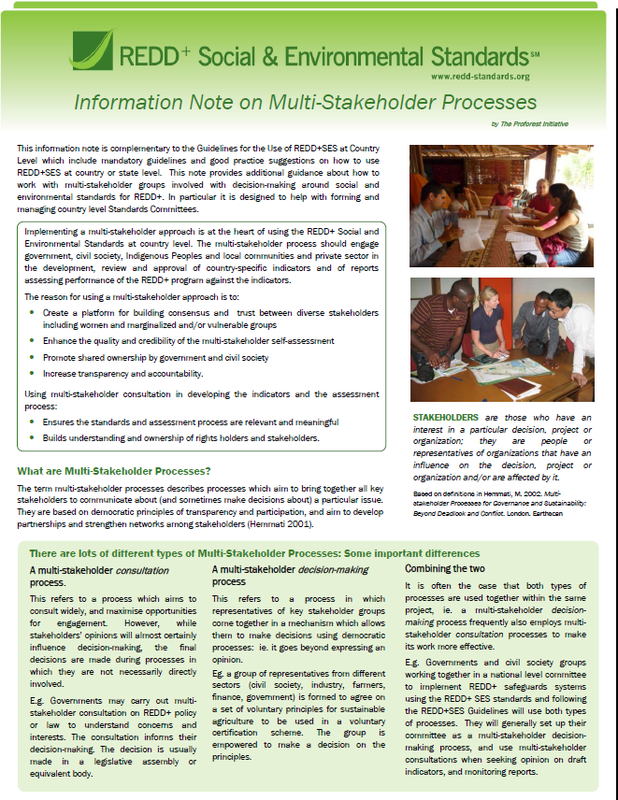 Combining a multi-stakeholder consultation and decision making process. It is often the case that both types of processes are used together within the same project, ie. a multi-stakeholder decision-making process frequently also employs multi-stakeholder consultation processes to make its work more effective. The REDD+ SES Initiative put a strong emphasis on promoting a balanced participation of stakeholders potentially affected by the REDD+ or other land use strategy and action plans in the development of a Country Safeguards Approach and Safeguards Information Systems. The multi-stakeholder process should engage government, civil society, Indigenous Peoples and local communities, private sector and other relevant stakeholders in the interpretation of REDD+ safeguards to country context, the development of country-specific indicators and the review of information on how REDD+ safeguards are addressed and respected. The REDD+ SES Initiative developed a series of capacity building materials and guidance on approaches to manage multi-stakeholder processes. 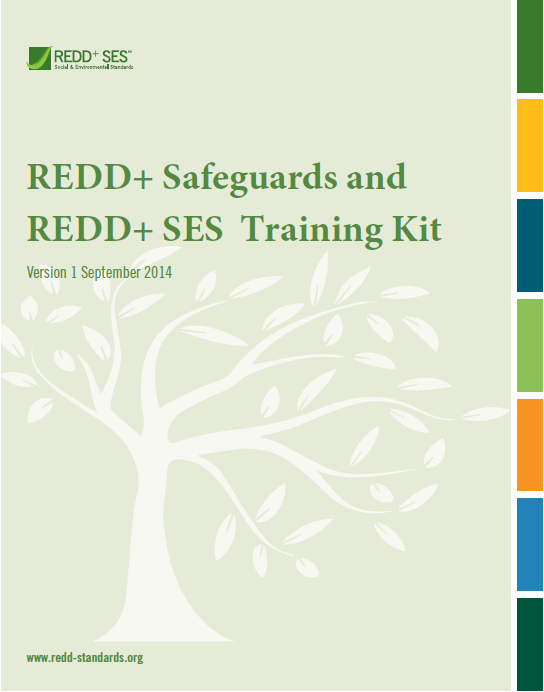 This training kit is composed of a manual, presentations, activities and summaries for REDD+ practionners to provide capacity building on REDD+ safeguards in an interactive manner.